Thoughts: Oscar’s show is one I look forward to every season. Always exuberant and sophisticated, Oscar’s desgins are a girl’s dream closet (for cocktail hour, anyway). The designer looked to the garden for this colleciton sending out one floral piece after another: green leaf-like prints on a strapless gown, 3-D peonies in ombre pinks. Even the palette was reminiscient of flowers in the garden: blushes, reds, celadons, and neutrals. The Spanish-esque influence was seen in the chantilly-lace (LOVE that white lace dress with the black sash) details on the party frocks. Thoughts: The first thing I noticed about this collection was not the clothes, but rather the way Ms. Rose styled her model’s hair. It was in a disheveled, fishtail braids with deep side-parts. I was immedietly intrigued. This messy look contrasted perfectly with the polished, girly-girl looks that Ms. Rose is known for. Working with metallic tweeds, printed silk and embroidered tulle, Rose’s collection was chock-full of to-die-for party party dresses. My favorite? A coral one-shoulder sheath with an embroidered belt. (Let’s be honest: they’re all my favorite). Thoughts: Life’s a beach for Mr. Kors. 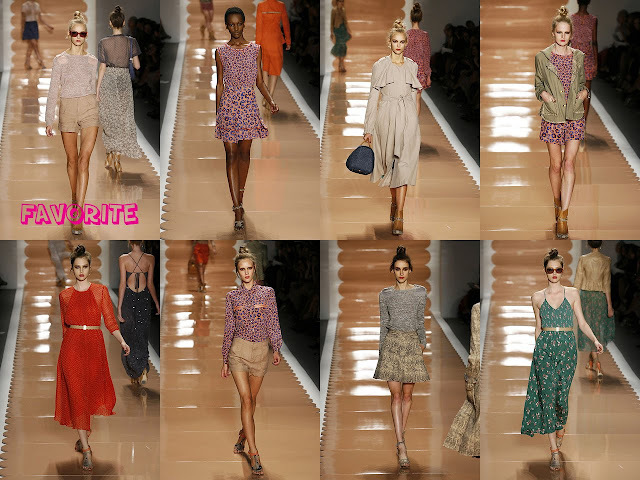 For Spring 2011, the Project Runway judge presented a collection full of easy-breezy pieces, including oversized cardigans, gray cotton sweatshirts, and tissue-cashmere pieces (note: the stunning daffodil dress). Staying true to what he does best, American sportswear, Kors took our favorite closet staples (sweatshirts, tank dresses, trench coats) and put his own spin on them. The result? A wear-me-now-and-forever chic collection. Inspiration: The surfer-girl of late is all grown-up! Thoughts: PS is all grown up. The Spring 2011 collection has come a long way from the surfer-chic, tye-dye fabulousness we saw a year ago. This time around the designer duo presented a more polished, womanly aesthetic in the form of ladylike jacket-skirt combos and tweed dresses. Lazaro Hernandez and Jack McCollough didn’t want you to feel like you were wearing your grandmother’s suits, though, so they kept it cool by introducing neon tweeds, lingerie-revealing sheaths, and sequined hologram dresses. 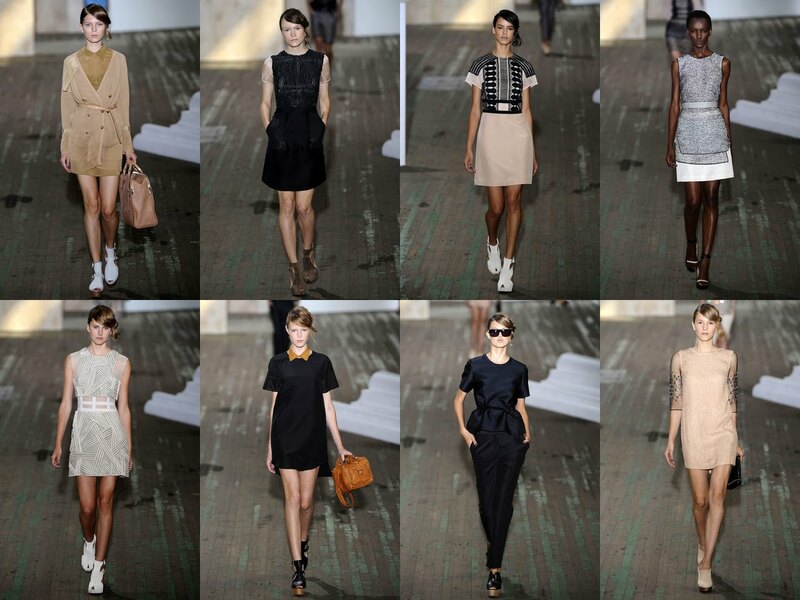 Thoughts: “Reduction and removing the things that don’t matter” is how Phillip Lim described this collection. Working with a muted palette of camels and taupes contrasted by light blues and coppers, Lim sent structured looks down his runway – jacquard jackets and simple shifts with sheer sleeves. Taking the minimalist approach, this collection was ultra-clean and more focused than we’ve ever seen it. Thoughts: Rebecca Taylor looked to the disco decade for her Spring 2011 collection sending halter-top dresses, denim bell-bottoms, and silk rompers down the runway. (Can’t you see Ali MacGraw in that canvas trench?) Staying true to form, though, the designer kept it girly with scalloped-edge details and lacy camisoles in a feminine palette of creamy peaches, taupes, and cherry reds. Playful prints in leopard (my favorite!) and snakeskin gave the collection the cool factor ideal for the warmer months to come. Thoughts: A look in the mirror was all Amy Smilovic needed for inspiration for her Spring 2011 collection. The designer infused her own personal style into the collection full of circle skirts, playsuits, and party dresses. There were ultra-modern and simple looks – like the bright orange jacket and pleated short – contrasted by the perfect-for-a-party looks: basketweave sleeveless dresses with circle skirts. I love the whole roundup. Lela and Oscar are my favs…esp the orange one-shoulder numbers! I've seen lots of orange for next season on the runways!